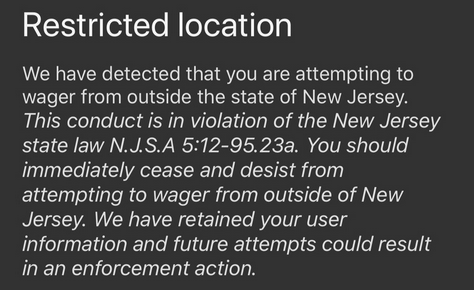 Trying to access the DraftKings sports betting app outside the state of New Jersey may land you in a whole heap of trouble, so says the ominous message that had popped up when one attempted to do so the first few weeks of its introduction. Here is the message that appeared after we attempted to navigate through the app from the state of Florida. It should be noted that only in the state of Washington is there an actual law that criminalizes the online gambler, and even that law has yet to be enforced. Sports gamblers have long accessed internationally licensed online sports books with impunity. We will say that the company claimed this to be a bug that has since stopped appearing when attempting to maneauver around the app now that the new Football season is under way. This was problematic for DraftKings in that folks from around the United States - and world for that matter - can place bets with the app, provided they are in the Garden State. Millions of people travel through Newark Liberty Airport each year. Those who wish to take advantage of the DraftKings app while visiting will likely want to set up their accounts prior to entering the state. Indeed, this is what we were attempting to do prior to our upcoming trip to New Jersey a few weeks prior to the new Football season. ESPN sports reporter, Darren Rovell, confirmed his experience with the Draftkings app upon its initial launch. "With DraftKings going mobile sports betting for all today in New Jersey, I crossed over state lines to New York to see just how good the geofencing is. They passed. And I’m apparently on some watch list now." These types of strong arm messaging tactics have been commonplace in the U.S. online wagering market for years. Folks tend to forget that horse racing is legal on the Web and has tended to benefit the offshore establishments, especially during major race events like the Kentucky Derby. Forget that nearly half the states forbid horse wagering with U.S.-based sites, they also tend to be seemingly run by their legal counsel (Yep, Uncle Sam will want a piece of your betting action - win or lose - a la IRS reporting by said firms). In the case of the DraftKings app, one needs to provide their social security number information and home address before they can even begin exploring the site, only to be prompted to GET OUT or maybe get arrested. DraftKings have been successful in the U.S. market on the daily fantasy sports side so it's likely they resolve a lot of the early issues such as horrible Major League Baseball lines and difficult navigation for those outside the state looking to set up an account before their visit. The obvious fear is the inability to get paid on a wager placed in NJ after departing the state, assuming they can't access important aspects of the app. It should also be noted that a tax of 13% will be imposed on those placing bets via the app in New Jersey. International sites do not impose a tax whatsoever. And, unlike the offshore sportsbooks, which allow one to be 18 years or older to place a bet, all US-facing sports wagering apps and sites will require users to be 21 or older.